Sometimes All You Really Need Is A Slice Of Pizza! You are here: Home / Uncategorized / Sometimes All You Really Need Is A Slice Of Pizza! Whew….you ever have one of those parenting seasons where life seems to go by a million miles a minute? Those weeks (or months) where it seems like the second your walking out of one doctor’s office, your walking in to another? One of those months (or years) where you wish you could freeze time just so you could stop and catch your breath? We’ve been going through one of those whirlwind seasons in our household the last few months. In addition to the regular four times a week developmental therapy appointments, we were dealing with Noah potentially having infantile spasms, and as if that wasn’t enough, leukemia….oh and did I mention those two holes he has in his heart? Ummm, yah? Talk about needing a drink vacation! As a good friend once told me; parenting will always be different than what you expect it to be. And as scary as that can be, it’s all worth it. There are few joys this side of Heaven like the joy that comes from being a parent. 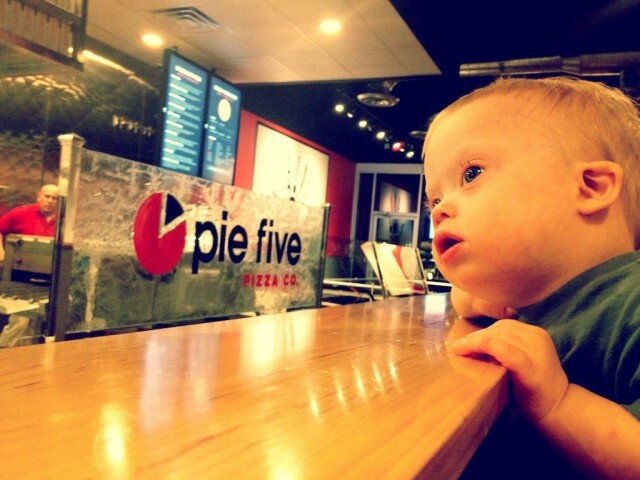 Tonight our friend Jonathan invited Noah and I to check a new Pizza place that opened up called Pie Five Pizza Co. If you have one in your area I highly suggest checking it out. The best to describe it is sort of the “Subway of pizzas.” You walk to the pizza bar and pick out the various toppings you want on your pizza, and they cook it right in front of you. Now that I think about it, I guess all pizza places are sort of like the Subway of pizzas….oh well. It was still super yummy. 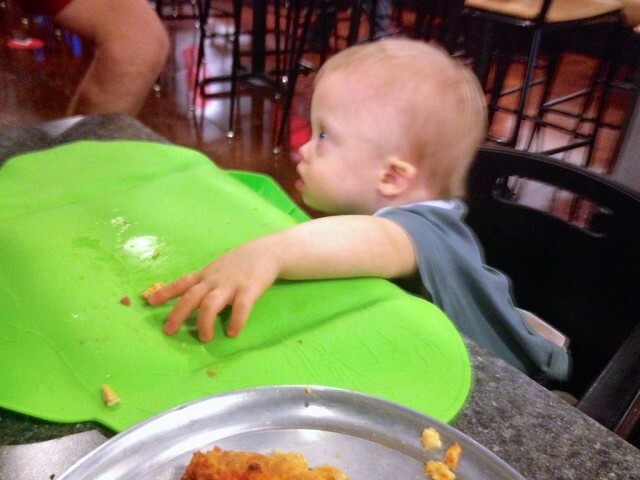 And as you can see Noah is a huge fan of pizza….just like his daddy. If you’re in one of those parenting seasons right now where it feels like everything is raining (or pouring) down on you, I just want to remind you that it’s just that, a season. Seasons come and go. Things will slow down. You will havenormal weekends. You will laugh again. I promise. What sort of parenting season are you in right now? What does you and your family do to de-stress? Leave a comment below and tell us about it. Love love the green table bib ( ?) where can I find one? Best baby item I’ve seen in a long time!